January to April, Tuesday, Wednesday & Friday 10 am-4:30 pm, Thursday 10 am-8 pm, Sat. 1 pm-4:30 pm, Closed Sundays & Mondays. May to December, Mon. to Sat. 10 am-4:30 pm, Sun. 1 pm-4:30 pm. Extended Hours Thursdays 4:30 pm to 8 pm. The Huron County Museum is home to historical and cultural exhibitions, both temporary and permanent. Thousands of artifacts illustrate the history of both our rural and urban communities in a variety of themes and topics. Permanent exhibitions feature early settlement, agriculture, military and main street galleries including a full-size steam locomotive central to the building. A variety of temporary exhibtions throughout the year investigate and explore topics of local significance. The Huron County Museum offers a variety of events, activities and exhibits throughout the yar to welcome the public throug our doors. Gratefully, we accept donations of historical items from members of the local and larger community allowing our collectio to grow. We continue to endevour to tell the stories of Huron County in a variety of methods on-site, off-site and on-line. The Museum also houses the Huron County Archives. Appointments for research available. 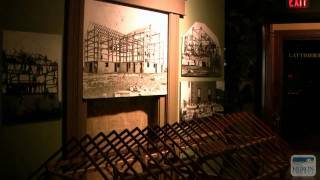 Take a tour of the Huron County Museum with Assistant Curator, Elizabeth French-Gibson. Produced for Ontario's West Coast.